So who was really the star? So who really was the star? The recent World Cup results in South Africa should serve as an eye opener to everyone, especially those in the civil service. In order to shine, one must alter one’s mindset and adapt to changing times. Imagine in a game of football, what ultimately caught attention was not Wayne Rooney, or Lionel Messi, or Steven Gerrard and John Terry. Their star powers were not enough for scores! What caught the most attention, eclipsing even Spain the ultimate winners, was Paul the Octopus. An outsider, non-football player (non-human I might add) and an unassuming sage – who had nothing what so ever to do with the game of football – caught everyone’s attention. Because it brought the much needed excitement in what many said was a disappointing performance by world-class superstars. Herein lie lessons we can learn from, collectively. All too often we are in a game, albeit a job, for so long that we perceive it’s our own to claim and no one else’s. We think of it as our birth right as we are the “indigenous, the bumiputra and the ones with the only right over it”. We psyche ourselves into believing, even to the point of self-deception, that only WE can do the job. And, an outsider could not survive the pace, or know the rhythm, not the least sing the blues when days are tough. We build a “club mentality” amongst ourselves and subliminally stifle all else that seems foreign to us. We insist that we are the deserving “stars” of any right that the job might offer. Yet when we are told to raise our game and deliver, we fail, as England did at the World Cup; so abysmally. England has some of the leading and most profitable football clubs in the world with star powers almost reaching Hollywood celebrity status. Yet when they disbanded the clubs, and got the country to play for its own people, these stars lost terribly. Why? The greatness of their clubs relied on non-English players. Look at Arsenal. It is made up almost wholly of non-English players. Another glaring example is Germany in this World Cup. They had 11 non-Germans playing for them. I make these points simply to illustrate the obvious. The harsh reality of competitiveness is that it is blind to race, colour, creed or gender. In a borderless world of today, it would seem so rhetorical to even suggest we need fortitude to compete. NEED is not the noun we can use any longer. The real noun for now is, NORM. It is a norm, a way of life, and presumed verdict that to be different, you need a difference. How we make that difference lies in our own capabilities and wherewithal, individually and collectively. We can no longer play traditional football and expect to win. We saw that in Brazil, Argentina and England. Great teams, with such superstar power countries. We can no longer just be the largest economy in the world and demand control. We are seeing that in America and how vulnerable it has become to a devaluing of the Renminbi of China, whose economy was less competitive than Malaysia’s just 10 years ago. What is certain today is that we need to earn our keep. Earn our value. Build our own self-worth. What is also clear is that we need to work in strength individually and collectively as a team. That is as real as day. 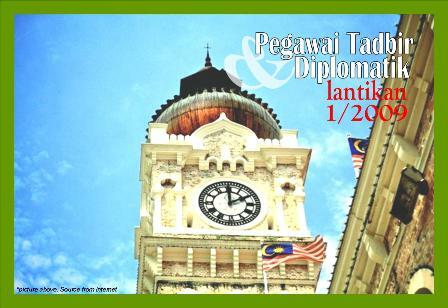 The days when being in the Administrative and Diplomatic Service or PTD was seen as premier are long gone, passe. The above scenario is fast nearing extinction in its class if not form. It is being displaced by a brand called “Public Service of Malaysia”. This brand’s constituents can come from anywhere – from within and without the service, from within and without PTD rankings. The guy who turns up at the counter for a service, or writes you a complaint really doesn’t care if you are from the closed or open service. He doesn’t care if you are PTD Officer at a super scale A or Turus 1. He only cares for his service. If a customer is greeted with bad service, the traditional – “Ah, the typical civil servant” verdict is fast uttered. The customer wouldn’t say: “Oh well, he was a PTD Officer and that is why I had good service or that she is from a closed service and a non-PTD, and gee no wonder she couldn’t serve!” No one really cares. In fact they know not of the difference in a space where service delivery reigns. Do people even care that the French team is made of non-French? Or that Arsenal’s team is non-English? What they remember is the performance of the team. The time when PTDs were seen exclusive and a cut above the rest in the service is a thing of the past. This system has been disposed of not by you or me, but by the determinants of the times. We only have to read the media for this testament. A day doesn’t go by when we do not have some editorial and/or letter to the editors on public officials. From The Star to Utusan Malaysia to Malaysiakini to Malaysian Insider. You name it. Sometimes, many times, from ourselves to ourselves! When we are customers of the public service ourselves, none, and I repeat none, would delineate the service by PTD and the rest. When a doctor at the government hospital is slow in service, they do not refer him as a non-PTD. Or an engineer from PWD. Or a lawyer from the Attorney-General’s Chambers. What is written about is of the “public service” in its brand collectively, specifically, and consummately! When David Cameron, the current British Prime Minister, was running for office he suffered the brand of being an elite Oxford University graduate. He was simply seen as being too upper class and aloof, and plainly out of touch with what the people of Britain wanted and needed. He had to very quickly brush off the upper crust demeanour and look “normal”. His colleague and the current Chancellor of Exchequer, George Osborne, was asked to lie low during elections because he seemed even more upper class for the needs of the people of Britain. The Conservative Party feared loss at a time when Britain saw one of its worse recessions. The Britain today is different. The once immigrants from all over the world, are British today. They brought in an unlikely face to woo the people of Britain again. A working class, Muslim lawyer, Baroness Sayeeda Warsi became the chairman of the Conservative Party. A country that created the class system, conquered and ruled so many countries around the world and started the game of football, today, lost football even before making the semi-finals and had to conceal upper class credentials for fear of reprieve at the polls. It has a British Pakistani chairing the oldest party in that country. The party once led by Winston Churchill and Margaret Thatcher. The party that led World War II and conquered many countries, and Malaysia included. So if you doubt change is lurking, you are right. It is not! It is here to displace those reticent to change. The PTD is not exclusive. It can never be if Malaysia is to see a better tomorrow. They no longer ask for a PTD, or of a certain race or someone of a particular service ranking. Why? Because they want to look good themselves. A leader can only be as good as the officers who work with and for them. Each of our jobs, and mine included, can be done by a non-PTD Officer today. It can be done by someone outside of the public service altogether. It can be done by a Malaysian from any race. Nissan and many Japanese companies can be helmed by non-Japanese! The cynicism from outside has always been, “Well you know in the public service, if you bungle you are just transferred.” No one is sacked. Or if we are appointed to a high post we can be complacent until retirement. Colleagues, this is not true. What is true is that junior officers can be promoted to be bosses of their once bosses because their performance was of greater significance. What is true is that non-PTD Officers can be groomed into PTD posts. What is true is that non-public officials can be recruited into the public service at comparable levels and remuneration structure. That PTD officials can be cross fertilised into GLCs, MNCs or any Cs! Why? In focus today is no longer the grade, or the origin of the official or the race but the capability and potential. You may prefer a black cat or a white cat; but in the final analysis, as Deng Xiao Peng was reputed to have said, “I do not care if it is a black cat or a white cat. It is a good cat so long as it catches mice.” In the 27th century, a good cat will be a cat that not only catches mice but also does other multiple functions. Charles Bolden, the Nasa chief recently said in an interview with the Al Jazeera network, “If you’re going to go to the Moon, Mars or a nearby star you’re going to need the cooperation of the international community. If the first country to send Man to the Moon concedes that it requires outside skills to excel, we need to only reflect if our own is able to sustain us to the end of our working careers. If the country that once professed class as its greatness is desperately shedding it to serve the times, we need to only assess the fragility of our current class system and mindset in the public service. We must change very quickly when we are at the top of our game like Germany, Spain and the Netherlands have done, or be prepared to be sidelined like England and France at the World Cup. No amount of star power will be of use, if in the final analysis we cannot individually and/or collectively make THE difference to what matters most – MALAYSIA and its people. No amount of leverage and birth right testimonies would rank Malaysia any better in world rankings if in our own rights we cannot contribute to Malaysia’s greatness! If we do not individually and collectively change for and with the times and shed the traditions that stifle us, we risk being displaced by not only non-PTDs, but non-public officials. In the final analysis that is the bare truth for the Public Service of Malaysia. > Tan Sri Mohd Sidek Hassan is the Chief Secretary to the Government and a prime mover in trying to reform the civil service.